Rain didn’t spoil the ride home, something else did. Yesterday’s ride was crunchy, the new chain didn’t agree with the old sprockets. they’re too worn for the chain’s links to mate well on the lower gears (17 & 19). Interestingly, the last time this problem arose, it was the 16 & 17 tooth cogs that had worn out. The change, I suggest, came from my tendonitis. Over the last year, I have deliberately ridden a lower gear, especially in the winter when soreness in that ankle is worse. So, this year, the gear cluster has worn out differently. Anyway, after all that work fitting a new freehub and bearing cones, the hub itself has failed. 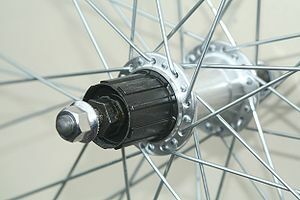 the spoke-hole flange has broken away releasing one spoke on the chainside. the annoying bike maintainance saga continues. I will tell you (excited readers) what I have decided to do about it after a night’s sleep. This entry was posted in Cycling and tagged Freehub. Bookmark the permalink.